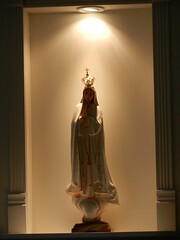 On Friday, in order to inaugurate the center, the first one to set foot inside was a statue of Our Lady of Fatima. 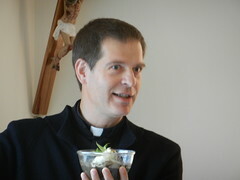 Afterwards, the young people had a reunion with the Servant Priests; the day ended with the celebration of the Eucharist. On Saturday and Sunday, we had two meditations each morning and in the afternoon we had a formation talk, we prayed the rosary, confessions were available, and we had mass. From Saturday afternoon at 6:00 o’clock until Sunday morning at 9 A.M., we had hourly turns of adoration before the Blessed Sacrament. The kids, young people, and adults who came (87 in all) not only learned a lot from the scheduled talks and the meetings, but also had a lot of fun as well. Since the feast of the Immaculate Conception was drawing near, we inaugurated our Prayer Center by serenading Our Lady with a traditional ¨Mariachi¨. It was a beautiful moment in which we all united in order to sing and give thanks to Our Dear Mother. Our retreat was a wonderful success thanks to the participation of Home of the Mother members, not just from Canada, but from Kansas and Michigan as well. 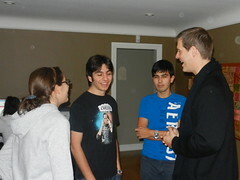 The love and joy that characterize the H.M. meetings were present from the beginning until the end of our retreat. Without exception, everyone had a positive experience and it was agreed that, since Our Lord had given us our own place to hold Home of the Mother meetings, "We should have these retreats more often." With the help of our Heavenly Father and Our Blessed Mother, we hope it really happens.